Renault Trucks has begun flying drones inside one of its factories in order to make manufacturing and stock inventory more efficient. The Renault Trucks Axle Centre in Lyon Saint-Priest in France is using the drone to perform inventory control operations which, until now, have been carried out manually by an employee using binoculars. Using built-in mapping features and a pre-determined flight plan, the drone reads the barcodes on pallets using three scanners on its front. It can take an inventory of a location in six seconds, which is ten times quicker than with a manual system. Photographs are also taken of each location, enabling any issues on pallets to be viewed easily. “Working with our partner Hardis, we studied the positioning and specific characteristics of our storage racks in order to draw up a precise flight plan and program it on a table,” explained Vincent Marlinge, Renault Trucks Axle Factory Manager. The device is completely autonomous: the operator supervises the flight plan rather than controlling the drone. Once the inventory is completed, the drone displays a visual indication of compliant and non-compliant locations, enabling logistics operators to focus their efforts on discrepancies with the information system. MAN Truck and Bus UK Ltd has appointed Daniel Holbein to the position UK Head of Van. In the new role, Holbein will have overall responsibility for the MAN TGE product range, vehicle sales, volume planning and all van operations within the UK, reporting directly to the UK Managing Director, Thomas Hemmerich. Commenting on the appointment, Thomas Hemmerich said: “I am absolutely thrilled that Daniel will take on responsibility for the MAN TGE Van range here in the UK and in doing so join the Board of Directors. Daniel started his career with MAN Truck and Bus AG in 2011 and until 2015 had held key management positions in Germany, with global responsibilities. In 2016 he became Head of Price and Margin for the truck segment within Truck Sales based in Munich. Volkswagen Commercial Vehicles is launching a wheelchair-accessible ‘Engineered For You’ conversion of the Caddy Life compact van at the CV Show. The vehicle is built by Volkswagen Commercial Vehicles’ Recognised Partner Lewis Reed, one of only three such converters to offer a wheelchair-accessible vehicle (WAV). Volkswagen Commercial Vehicles sells more than 2,000 WAVs per year through converters, with the new model set to be offered through the ‘Engineered For You’ scheme. Available in short or long wheelbase, the maximum capacity of the vehicle is five seats plus a wheelchair, with the adaptations ensuring headroom and space for both rear passengers and wheelchair users is not compromised. For ease of access, the model features an integrated TorSpring® lightweight ramp and fully automated rear entry system. Lewis Reed offers a choice of floor fittings to ensure maximum comfort plus a full options range. As a Recognised Partner, the Caddy WAV comes with a conversion warranty that matches the base vehicle. Anglian Water has introduced 10 new Nissan e-NV200 electric vans to its fleet as part of a strategy to reduce fleet emissions. The new Nissan e-NV200s will be used for Anglian Water employees who conduct more localised visits. The company has installed electric charging stations across a number of its sites to facilitate recharging. Anglian Water say the new vans will provide an opportunity for the company to cut its energy usage and become even more efficient. Number of CVs built in the UK up 53.5% in February, as 9,233 leave production lines. Growth in demand from both overseas and UK markets, up 51.9% and 57.3% respectively. Year-to-date performance rises by 51.3% on same period last year, up 6,241 units. The number of CVs manufactured for both domestic and export markets posted significant gains in the month, growing by 57.3% and 51.9% respectively. Almost seven in 10 British CVs were destined for global markets in February, as demand from overseas continued to drive output. Year-to-date, the market painted a similar picture, with manufacturing up by 51.3% compared with the same and particularly weak period last year. In the first two months of the year 18,415 vans, trucks, taxis, buses and coaches left British production lines. However, output is expected to slow next quarter in preparation for the subsequent ramp-up for new model lines. 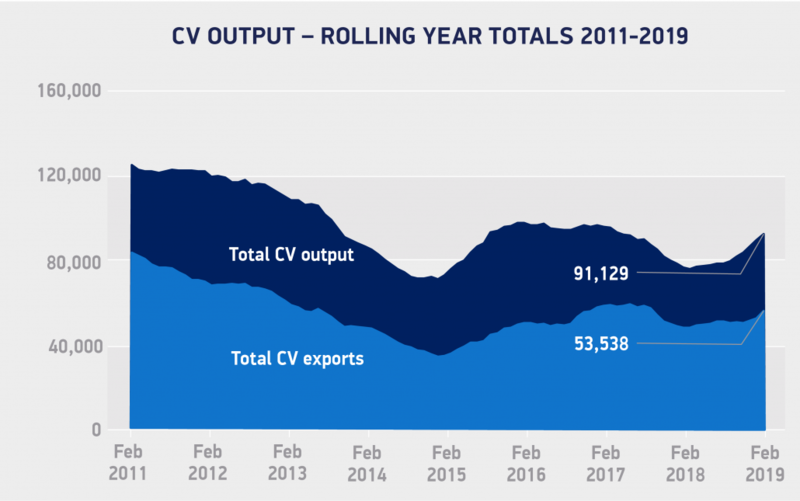 While the positive news continues for UK CV manufacturing, it’s important to highlight that this low volume industry is cyclical and experiences large percentage swings when compared month on month. Although both demand at home and overseas has seen double-digit growth, still almost two thirds of British-built CVs are destined for export, the majority to the EU. This signifies just how vital a deal that retains free and frictionless trade with the EU is for this sector. Ford is to launch a new fuel-saving technology feature to its best-selling Transit and Transit Custom models later this year. EcoGuide will work with the vehicle’s sat nav system to help drivers go about their business in a more fuel-efficient manner, while analysing driving behaviour and offering feedback via the instrument cluster to help achieve the optimum efficiency for the road conditions ahead. Ford says it will first introduce EcoGuide to new Transit, Transit Custom van and Tourneo Custom people movers from mid-2019. “Driving smoothly and assessing the road ahead as much as possible to avoid unnecessary braking and acceleration can improve your fuel consumption by as much as 12 per cent,” said Rebecca Ashton, Head of Policy and Research for UK road safety organisation IAM RoadSmart, which runs eco-driving training courses approved by the Energy Saving Trust. Changing habits to boost efficiency, EcoGuide helps customers drive more smoothly by using information from Ford satellite navigation and giving them advance notice of road junctions, slopes and bends, or upcoming speed limits. Based on information from the sat-nav on road junctions, slopes and bends, or upcoming speed limits, the system prompts the driver to decelerate, while the vehicle’s gear shift indicator advises the ideal gear, using icons in the instrument cluster, to avoid unnecessary braking or acceleration. The UK’s first full-sized autonomous bus has begun trials in a bus depot in Manchester. The test of the autonomous single-decker is a partnership between bus manufacturer Stagecoach Manchester, Alexander Dennis Limited (ADL) and technology company Fusion Processing.The ADL bus has been fitted with a CAVstar system provided by Fusion Processing Ltd, and is being trialled by Stagecoach. The 11.5m ADL Enviro200 bus is now able to operate autonomously within the confines of Stagecoach’s Sharston depot, and the partners say that the technology being used could also provide future road safety benefits for vehicles operating in manual mode. The trial includes the bus being used in autonomous mode within the depot environment, to carry out movements such as parking and moving into the bus wash. The first public demonstration of the bus was held on 18th March 2019, attended by the Chief Executives of each partner organisation. The software being used in the pilot vehicle also forms the basis for a significant autonomous vehicle trial due to get underway in 2020 with a fleet of five autonomous buses carrying passengers between Fife and Edinburgh, across the Forth Road Bridge Corridor. Rob Skelton is the Director of the CV Show, which once again is a sell-out. The show takes place from 30 April to 2 May at the NEC in Birmingham and is the biggest automotive trade show in the UK. Transport News Brief caught up with Rob ahead of this year’s event. What are the big draws for visitors at this year’s Show? As well as the main draw of the show, which is its status as the single biggest event in the UK for those involved in the commercial vehicle and logistics industries, the 2019 show is offering up some major product launches. MAN Truck & Bus UK is using the show to premiere a number of new products; the XLION 6×2 TGX Tractor, a TGE Flatframe chassis cowl, the TGE Minibus, the New D15 Truck Engine and a range topping 250 tonne TGX 41.640 8×4/4 BBS Heavy Haulage tractor. The new Vauxhall Vivarowill be making its global show debut as part of a combined Peugeot, Citroen and Vauxhall display; VW Commercial Vehicles will be exhibiting its new range of electrified models; and Transdek will be premiering a new 52-pallet double-deck trailer. Other attractions will be the return to the show of DAF Trucks and a competition at LDV to win a free van. Are there any new features, or developments of existing features that show visitors need to be aware of? New for this year are live vehicle demonstrations on the Ford stand and a new outside display by DAF. There’ll also be live and interactive elements, too. We’re expecting a busy few weeks. In terms of business, how well has this year’s show been received and is the CV industry still feeling positive towards attending ? We’ve certainly not seen anything to suggest otherwise – show space is over 99% sold out with over 400 exhibitors from across the industry, while pre-registration is suggesting we’ll once again see around 20,000 visitors through the halls. How do you think exhibitors at the show will demonstrate how they’re rising to the challenges that the industry faces at the moment? The future of diesel is one, its alternatives and the prospect of future legislation. Our industry is reliant on it, and it’s still an extremely efficient means of transporting goods. But finding alternatives isn’t going to happen overnight. Environmental concerns about freight are also a challenge, as are congestion charges levied on hauliers. Then there’s the need for more electric vehicle infrastructure. The industry is developing apace, but it also needs to keep that rapid development going. Innovation and product development will address these issues, along with bulk handling and loading solutions, which will also help mitigate the driver shortage. Transdek’s new double-decker trailer can accommodate 52 pallets, for example. The great thing about the CV industry is its adaptability and ability to react to change. It’s astonishing how quickly people in this industry can innovate and bring new technology to market, as the CV Show proves every year. How important do you think the CV Show is for those involved in the commercial vehicle and logistics industries? Operators of vehicle fleets of all sizes and variants (whether heavy or light commercial) will see on display the innovation and technological developments in the industry. Along with the supporting industries in the CV sector showing new products and services- that innovation we speak about and the pace of change. This is their shop window. Are you seeing any trends develop among exhibitors in relation to how they demonstrate new technologies? We’re starting to see a lot of exhibitors demonstrating their products in a dynamic way. Live examples of lifting technology, self-parking tech, EV systems – actually using the show to demonstrate them in action rather than in theory. Yorkshire-based bus manufacture Optare has been recognised for its leadership in zero-emission bus design. The company, headquartered in Sherburn-in-Elmet, West Yorks, was awarded the Excellence in Technology Award for its Metrodecker EV at the London Transport Awards, which recognise outstanding achievement in all modes of transportation in the capital. The judging panel selected the Optare Metrodecker EV ahead of solutions on rail, road, infrastructure, ticketing and information in delivering a zero-emission battery electric double deck bus. The London Transport Award is the Metrodecker’s third industry accolade. In November 2018, the British bus manufacturer’s Metrodecker EV was also recognised by the CILT and UK Bus Awards for its contribution to Environmental Improvement. An order for 31 Metrodecker EVs is currently in build and will enter service in June on Transport for London’s first zero emission double deck route. The residents of Ascension Island, a remote British Overseas Territory, are to benefit from their first proper purpose-built ambulance, supplied by Cartwright Conversions more than 4,400 miles away in Doncaster, South Yorkshire. Until it arrived at Ascension Island’s port of Georgetown, the only medical transport available was a “very basic” military-style Land Rover with no medical equipment on-board. Cartwright Conversions won the contract to supply the vehicle, complete with a defibrillator and oxygen supply, after the Ascension Islands Government put out a tender asking for the equivalent of an NHS frontline ambulance. They supplied an ex-demonstration model with extra equipment and a well-proven powerful engine that could cope with the climb from the island’s port of Georgetown to the inland settlement of Two Boats which is home to island’s school. Nathan Millington, Director of Operations and Facilities, for the Ascension Island Government, said: “We’re more than happy with it – it’s a very, very impressive bit of kit. It’s a quantum leap forward from what we had before. It’s nice to have something that’s of such a high standard”. Delivering the ambulance was a particular challenge for Cartwright – due to its remote location one thousand miles off the coast of Africa, the ocean swell can make it one of the most dangerous cargo landings in the world. The vehicle was sent out on a cargo ship that anchors off Ascension on the way to the Falkland Islands, then had to complete the last sea mile on a flat barge before being lifted by crane onto shore. Steve Shaw, Managing Director of Cartwright Conversions said: “This was definitely one of our more unusual requests and we were delighted to help out the people living on Ascension Island by supplying them with a fully-equipped ambulance”.